A play about the work of Mother Teresa. I had to put in a prelude, about a case of extreme wealth in India. It showed so well the miseries of untrammeled hedonism and acquistiveness. This of course is in the extremest contrast to the Mother Teresa Mission of Charity for the poorest of the poor. Four acts follow. The first act is the future saints formative period. The key-note is the foreboding of the immensity of the task of diving into a sea of poverty. You will be over-whelmed. The second act is actually prevailing, in that punishing round of duty to the helpless, in miserable conditions, day after day, from early hours to late at night. The third act is in lighter mood, with the dawning realisation of the world of this dedication led by an extraordinary woman. And how the buoyancy of her spirits meet the worldly skepticism of the media. The fourth act shows how the organisation of the Mission grows and diversifies and stabilises into a force for good in the world. 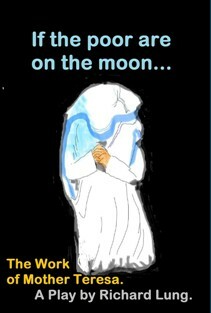 The title "If the poor are on the moon..." is taken from a well-known saying of Mother Teresa, which she completes by saying "we will go there, too." This play was liberated, as a separate book, from the first part of my fifth poetry collection, "Radical!"